200CC ENGINE for MOTORCYCLE & ATV. 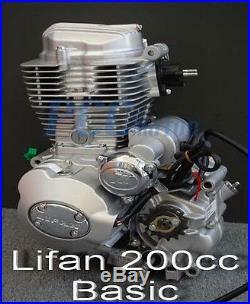 Brand new 200cc LIFAN High Performance Engine, 4 stroke, 5 speed manual. Air-cooled, electric start/kick start, single-cylinder, CDI ignition. This package only comes w ith Lifan 20 0cc engine, kick start and shifter. Bore x Stroke: 63.5mm x 62.2mm. Displacement: 197.0ml Type: single cylinder, 4-stroke, air-cooled by forced Bore x Stroke: 63.5mm x 62.2mm Displacement: 197.0ml Compression ratio: 9.0 : 1 Max. Engine Measurements: 19.6" x 15.7" x 13.8. Ratios: 2.769/1.882/1.400/1.130/0.960 Magneto: Permanent magnetic Voltage: 12 Volt Accessories Power: Lights and other accessories. This Motor should fit the following models: Note: This is not a guarantee, if you are unsure, please check with your local dealer. CM200 CRF150 CRF230 SL175 TLR200 TR200 XL175 XL185 XL200 XR185 XR200 SL100. The item "Air Cool LIFAN 200CC 5 SPeeD ENGINE MOTOR MOTORCYCLE DIRT BIKE ATV P EN25-BASIC" is in sale since Wednesday, July 1, 2015. This item is in the category "eBay Motors\Parts & Accessories\Motorcycle Parts\Engines & Engine Parts\Other Engines & Engine Parts". The seller is "pccmotoparts" and is located in Ontario, California. This item can be shipped worldwide.